Most big-game hunters have experienced "buck fever" at some point in their lives. You know the feeling. You are still-hunting or sitting in a blind and, all of a sudden, "there he is!!!" The little adrenal glands on top of your kidneys go into overdrive and drop their payload into your bloodstream. Your heart rate increases, your eyes dilate, your breathing become more shallow yet rapid, your vision becomes laser focused. This is why people hunt, jump out of planes, or swim with sharks! "Buck fever" tends to be a generic term for excitement that prevents you from performing the task at hand. I assume there is a Swahili term which loosely translates into "lion-fever", or "kudu-fever". I think it is ahhhh kupata ni mbali ya mimi!!!. There is a fine line between excitement and debilitating buck-fever. Fortunately, while I get excited and very focused when it comes to the "moment of truth" during a hunt, I've never had buck-fever to the point I could not get myself under control and make the shot. That is.... until recently. As I've shared before, I truly love squirrel hunting. (Yes, I realize it is not terribly PC nowadays to admit that in open company.) You get to stalk about the woods all camo'ed-up with a rifle. Two of my favorite, highly related activities. 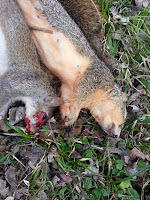 Squirrel are particularly challenging if you limit yourself to headshots with an accurate rimfire rifle. Plus, they have great vision and hearing. Wild squirrels are a very, very different when compared to the generally tame squirrels one might see in a park or in the city begging or stealing part of your bagel at lunch. No, truly wild squirrels are very wary, very paranoid and, having eyes on the sides of their heads and the "high-ground", are truly a challenge that will greatly hone your hunting and woodsman skills. Recently, I took it upon myself to coordinate the 2nd Annual Invitational Squirrel Hunt and Bragfest at our hunting lease. I might write an article about the event at some other time but in the end, we had 6 hunters participate. And as most men do when there is a competition, a great deal of trash-talking took place about someones' inability to shoot straight, old men blowing out a knee or hip, falling down an embankment into a creek, etc. This might come as a surprise to the good readers of this blog but I, shockingly, participated in some of this trash-talk. It could be argued that I was the ring-leader of such trash-talking. I now realize this was a mistake and contributed greatly to my performance anxiety during the hunt. After everyone had departed to their chosen area of the woods, I arrived at mine. I had selected a creek bottom that feeds into a river about a 1/4 mile away. This is my favorite part of the woods with its beautiful, 100+ year old oaks, grapevines and generally open ground. It is a squirrel hunters paradise. For a brief period of time, I honestly thought it was unfair to the other hunters that I had such a grand place. Just two weeks before, I had seen over 15 squirrel in this exact area in a span of minutes. This would almost be cheating and I reminded myself to be somewhat humble after announcing myself the winner after I lugged an obscene number of squirrels back to camp for the official counting over lunch. At this point, I believe God allowed me to experience a solid and needed dose of humility. Over the course of the next two hours, I saw nothing but vast squirrel-emptiness. A squirrel-desert. Same trees, same beautiful woods but not one squirrel. I slowly transitioned from thinking I would easily win the competition to becoming EXTREMELY concerned that I was going to get skunked. AND, being the event coordinator and chief trash-talker, I was literally dreading the ribbing I would get if I was, in fact, skunked. Adding to my anxiety were a continuous stream of rifle shots throughout the woods by the other 5 hunters. With every "crack", I assumed someone else was adding to their total while I had not yet taken the safety off my rifle. Finally, about 100 yards away, I saw a bit of movement through the woods. A squirrel!!! Finally, my luck had changed. I slowly......, carefully......, painstakingly...... eased closer to where this schizophrenia ADHD afflicted grey squirrel was scampering by a dead-fall. At about 35 yards, I set up behind a tree and used it as a solid perch. The safety was flicked off and I waited for longer than I was comfortable until I had an ethical, clean shot. Finally, its little head popped up unobstructed and I started to slowly squeeze off a shot just as my right leg started literally shaking uncontrollably!!!! What, was this a cramp? Muscle exhaustion from standing at attention for too long? I shifted my weight a bit to help with the circulation while trying to NOT scare away the squirrel. In the distance, another rifle report traveled through the woods. I tried to not think about who had just added to their total. Finally, it dawned on me... I had a severe case of buc... I mean squirrel-fever. This was horrible and only added to my growing anxiety. After several minutes of arguing with myself, proactively controlling my breathing and taking a wider stance near the tree, I was finally able to calm down to the point I could make a clean shot. 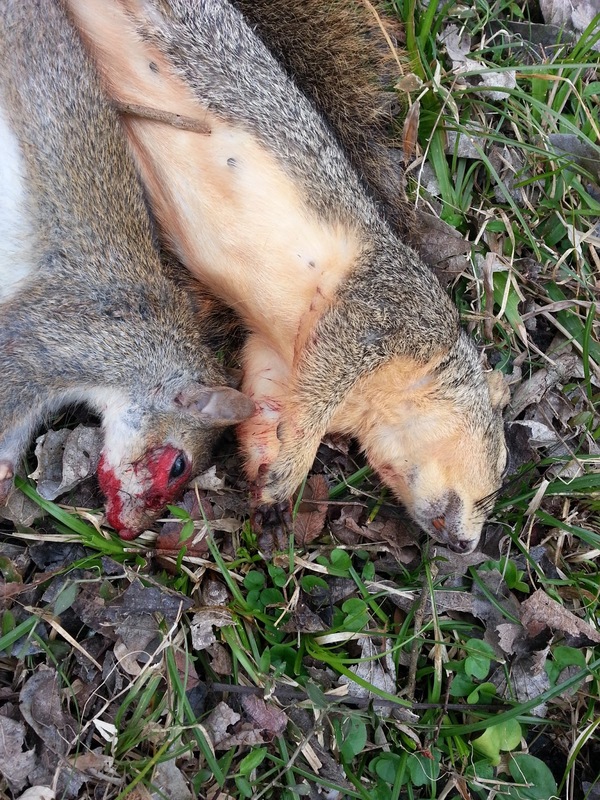 A second, unseen fox squirrel, popped its head up from behind a log to see what all the noise was about only to die 11 seconds later by a well placed 33 grain bullet. No shaking, no hesitation, no concerns this time. Honestly, I used to think people that experienced buck-fever were just weak and ill-disciplined but now, I'll never be so quick to judge.